Opponent's character only. Ambush (1). Reaction: After you win an challenge, kneel attached character. Then, that character's controller may give you 1 gold from his or her gold pool to stand that character. Attached character's controller must decide whether to pay you or not when Paid Off is triggered. He can't wait until later to pay you when he wants. Also, non-Forced Reactions are optional. 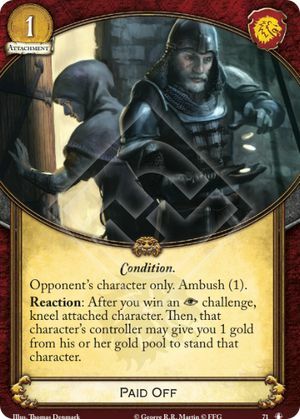 If Paid Off is attached to an opponent's character that's already kneeling, and you win an intrigue challenge, you simply don't trigger it.